Zion lives again in the form of Splinter Z. Vapor quality is proportional to the surface area in the heater and the Z nearly double that of the Splinter. This yields more even roasting and therefore a cleaner, purer taste. The larger heater is surrounded by heavy wall German Schott glass and thick exotic wood. Just spin the custom logo on to nearly any 50 watt mod box and you are ready for on demand fun. Looks like exotic Splinter Zs just hit the store. The Z is longer to accommodate a larger heater. It’s the difference between the Milaana and Zion. Splinter has Milaana heater, Z has Zion heater. As i understand it, the larger heater has more surface area so creates more robust heat, larger hits. The Splinter Z is per Ryan about 1/3 longer in length. Just ordered! Can not wait. 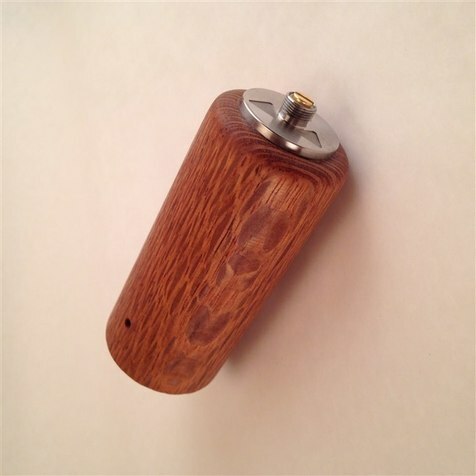 The splinter is amazing, can't wait to try it out with a Zion heater. Sit tight. Per Ryan's post on 420vapezone forum, "More Zion heaters should be arriving early next week so more should be available in 2-3 weeks." 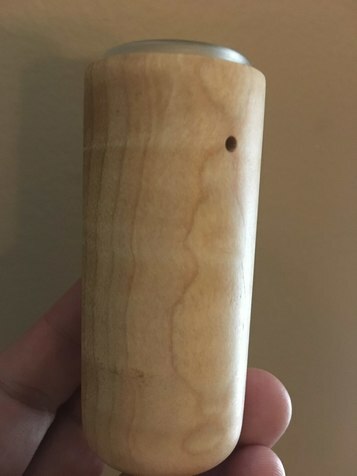 My Leopardwood Z arrived in the mail box about 90 minutes ago. Two stems later and I am in awe. Beastly in the best way possible! I've got a Lost Vape Therion two button model, and I used 32 watts to start with great success. Admittedly, I suppose I would be labelled a "flavor-chaser," and I start at 28 watts with a "regular"Splinter, but the effectiveness was greatly enhanced. Good to know, I have a Therion as well. Thanks! I have a splinter as well. And with the z I ordered the cooling mouth piece and with that no need for water. I thought the price was crazy until I used it. I will say it’s a lot easier to get clouds and big rips with the Z. 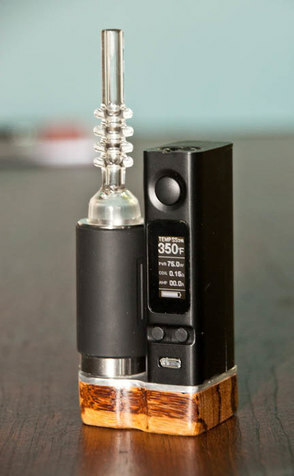 Show us the mouthpiece and the mod all rigged up please. 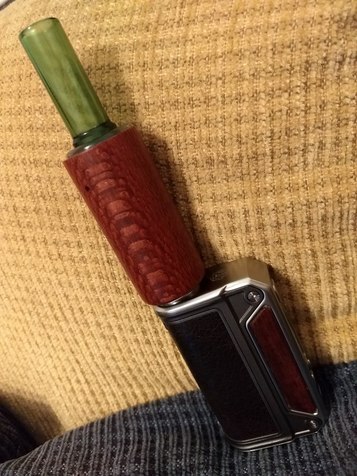 @Magicman My leopardwood two hole Z on Therion with short Milaana stem. Total height even with short stem an ungainly 8" tall. But does it ever perform! Someone will make a great side-by-side mod for these things soon. This is what we need for these...justjustin sidecar. I got the exact same set up. Crazy how fast the lepard wood z's sold out. Very happy I got one. The only difference is that I am using a VF cooling mouthpiece. Ill do a full review once I put another oz through it but this is hands down the best vape I ever used. 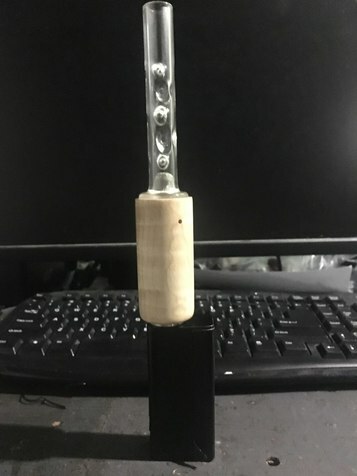 @Philly Yeah I have an assortment of stems, including the VF one and XL8R, but was purposely using a short stem in the photo to allow the fine leopardwood figuring to show while still managing to fit everything in the frame. Totally agree with your assessment of the Z's functioning - fantastic! This splinter z is abit of an eye saw Lol definitely need a new box mod to make it more appealing and smaller for me. But how’s the performance as I have a milaana which I really like ? im sure they think it is pretty good! :grin: I know I do, I dont have one but it is already very clear that it is a top performing the device possibly on the verge of revolutionary in terms of satisfaction from a portable. Time will tell. So I’ve been using both the Z and regular Splinter in tandem for a bit now just to see the differences. While some initial reviews were saying the Z takes a bit more time to ramp up I am finding the opposite. My first hit from cold from the Z is bigger than first cold hit from Splinter. I am using the exact same TC settings and pack for both on identical mods. how’s the taste compare between both and the milaana if possible ? Never tried a Milaana but the Z vapor holds good flavor longer through the bowl than the regular Splinter.